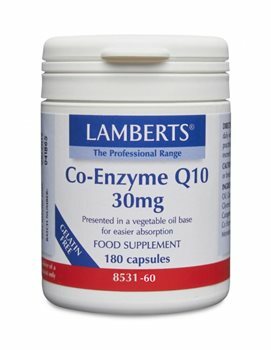 Lamberts Maximum Strength Co-Enzyme Q10 30mg is presented in a vegetable oil base for faster absorption and is endorsed by one of the original researchers who first discovered Co-Enzyme Q10. Co-Enzyme Q10 - 30mg (Ubiquinone). Sunflower Seed Oil, Capsule Shell (Modified Starch, Glycerol, Gelling Agent: Carrageenan, Colour: Iron Oxide), Co-Enzyme Q10, Sunflower Lecithin, Glyceryl Monostearate. Take 1 to 3 capsule daily with meals, or as directed by a practitioner or pharmacist. Do not exceed recommended daily dose. Food supplements should not be a substitute for a varied and balanced diet. I am grateful that I could order your products and have them delievered through you to the Netherlands. I do not have to pay higher costs for the importers for bringing it to the Netherlands & it is conveniently delivered with my post. Thank you very much! I look forward to be a regular customer. I will have to place my order 2 weeks before my supply is depleted to insure that the post delivers it while I am still amply stocked with my supplements. Great product, and great service from Healthstuff, thank you very much, will buy from you again. an excellent product and fast delivery!